Bob Henley was born on Tuesday, January 30, 1973, in Mobile, Alabama. 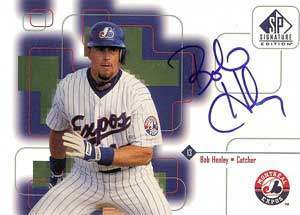 Henley was 25 years old when he broke into the big leagues on July 19, 1998, with the Montreal Expos. His biographical data, year-by-year hitting stats, fielding stats, pitching stats (where applicable), career totals, uniform numbers, salary data and miscellaneous items-of-interest are presented by Baseball Almanac on this comprehensive Bob Henley baseball stats page. Robert Clifton Henley was a Major League Baseball catcher for the Montreal Expos in 1998. Bob was the third Mobile County High School (Grand Bay, AL) player to make the majors, joining Tommie Agee (1962) and Cleon Jones (1963), and the first Okaloosa-Walton Community College player to make it to the show!